Order Desk can store all of your products and any additional details that may be necessary to help automate your workflow or that need to be sent to your fulfillment providers. We can also manage and sync inventory counts between most integrated services to make sure your shopping cart(s) show the most recent inventory reported from your fulfillment service. This guide covers how to work with inventory stored in Order Desk, including adding, storing and removing item details, creating bundles and syncing item details into your orders. For more information on how to manage inventory stock counts and how to work with quantities using Order Desk, click to see our How to Work with Inventory Quantities guide. To see our most frequently asked questions, including what Order Desk doesn't do with inventory, please scroll down to the FAQ section of this guide. For more information on the different ways you can add your inventory to Order Desk, please refer to the Adding Inventory section of the Getting Started guide. To access your inventory in Order Desk, click on Inventory Items under the Tools menu in the left sidebar. Any existing inventory items that have already been added will appear here. You can also add new items manually from this page. To quickly add all of your items from a spreadsheet, see the instructions in the Importing Spreadsheet Data guide. 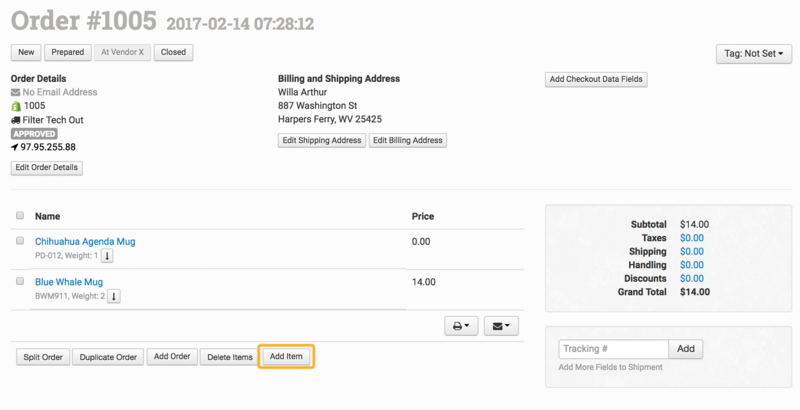 If your inventory is stored in Order Desk, you can use auto-select to easily add items to an order. For orders that already exist in Order Desk, click on the Add Item button. 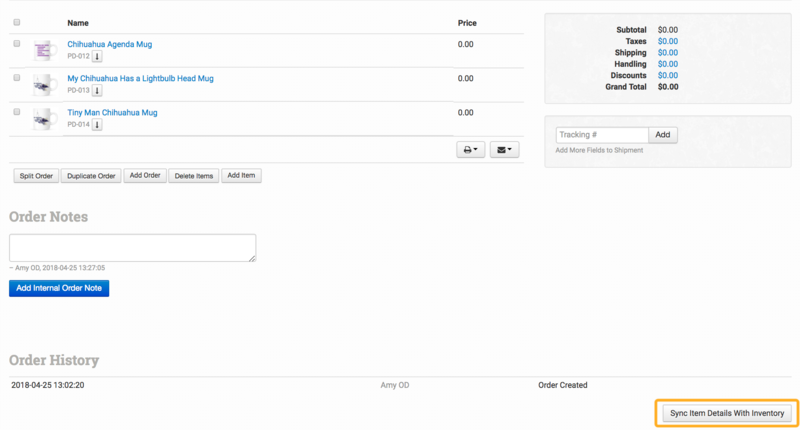 For orders being manually created in Order Desk, use the Name field in the product section. The Name and Code fields will automatically be populated with the item information. Inventory items can be used to store extra details about a product that can't always come in from the cart with orders. Often used for print on demand products, which require extra details to be synced into orders before being sent to a printer, this can also be useful for many different reasons, including splitting orders and saving information necessary for specific fulfillment situations. These details can include anything that needs to be added to an item such as the UPC, a link to the product image, or the name of the company or organization associated with the product.These details can be pulled into your emails, receipts or packing slips and export files. The location is for the vendor name for the product. Metadata and variations can be used to store custom details. To manually remove specific details about items, delete the info from the item and save your changes. For variations and metadata fields, click on the X next to the info to be deleted and then save. To remove item details in bulk, see the Removing Data from Inventory Items section in the Importing Spreadsheet Data guide. If you have extra item details saved to your inventory items here in Order Desk, you will probably want these details synced into your orders. This can be set up to automatically happen when orders import, but if you have any orders that are already in Order Desk and need to be synced, follow the instructions for how to do this manually for those orders. To enable Order Desk to automatically sync your extra item details into your orders as they download or import into Order Desk, head into your Store Settings page and enable the Automatically Sync Details With Inventory Items setting. Create inventory items in Order Desk for your multi-pack/bundled items using the item metadata. When an order comes into Order Desk, the bundle SKU will be replaced by the individual SKUs. If all of the individual product SKUs are also saved in Order Desk with any additional item details, these will also be synced into the order. Your store settings will need to have the automatically sync details with inventory items setting enabled for this to work. For more information on working with code replace, please refer to the code replace and code replace bundles section of the Product Code Match, Skip and Replace guide. There is also a section in that guide for how to set up print on demand bundles. If you sell a bundle made of multiple quantities of the same item, you can use an item metadata field called quantity_multiplier to break your bundle out into individual items. Set the quantity multiplier to the number of items that make up the bundle. When an order is added to Order Desk for this item, the bundle will be replaced by the individual items and the price of the bundle will be divided by the quantity multiplier number in an attempt to keep the price per item consistent. Please note that rounding can cause slight inaccuracies in the price per item—for instance, an $8 bundle of 3 items will come out to $2.66 each. You can combine code replace and quantity multiplier to first replace a SKU and then multiply it by the number of items that make up the original bundle. Set code replace to the SKU of the individual item and then set the quantity multiplier to tell Order Desk how many of the individual item make up the bundle. In this example, the single item Mini Tennis Ball Bundle (MTBB4) is swapped out with 4 individual Mini Tennis Ball (MTBB1) items in the order. Is Order Desk an inventory management app? Technically, no. Order Desk was designed to be an order management app, and that is where the strength and value of the app can be found. Because inventory goes hand in hand with orders, we have included inventory management features to the app over time to help with your order management. We will continue to add inventory features to the app and may in the future build out more robust inventory management capabilities, but for the time being, you might find limitations with our app if inventory management is ultimately what you need. Can you sync inventory from multiple warehouses? If you use different SKUs in different warehouses, yes, we will sync in their numbers and pass those back to your shopping cart(s). If you use the same SKUs at multiple warehouses, this does not work with Order Desk. Each warehouse can send in inventory reports, and it will update the items here, however if they're all sending reports for the exact same item SKUs, there won't be an honest representation of the inventory in stock, nor what the stock is at each separate warehouse. Each warehouse update would overwrite the last update from a different warehouse for the same SKUs. Does Order Desk create and/or push listings to shopping cart(s)? No. Order Desk can pull in products and orders from shopping carts, and it can pull in shipments and inventory updates from fulfillment services then send those details back to shopping carts. It cannot push listings to shopping carts. How often do you check for inventory updates through FTP and can this be increased? Import appointments for FTP run twice a day, every 12 hours. You can set the appointment time from your View Appointments page. This cannot be increased to more than twice a day, although you can manually run the appointment any time from your View Appointments page. Why isn't my inventory being updated in my shopping cart? Most shopping cart integrations have a Sync Inventory setting that needs to be enabled for Order Desk to send your inventory counts to your shopping cart. Check your integration settings for this setting and make sure it is enabled. Inventory is not typically updated immediately but can take up to 7 minutes after a change is made to any stock counts in Order Desk. If inventory sync is enabled for your shopping cart, inventory has been updated in Order Desk, and you've waited 7 minutes and it still isn't updating, contact Order Desk support.